Summary: The Sea Turtle Lighting Workshop is a four-hour workshop designed to teach the public about marine turtle lighting issues and what can be done to solve them. It brings together people from local governments, residents, business owners, lighting manufacturers, and other interested parties to learn about outdoor lighting practices for development adjacent to sea turtle nesting beaches. The presentation stresses practical, research-based information on sea turtle behavior and lighting options. We will augment the existing program by providing ten additional workshops to Florida beachfront communities that we have been unable to serve due to staffing constraints, and improving assessment of the program. 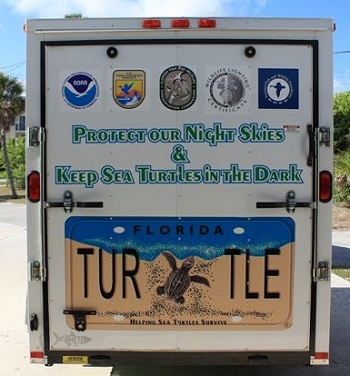 Results: Through the Official Marine Turtle Lighting Course, FWC staff was able to provide information on sea turtles and lights to a variety of entities across peninsular and panhandle Florida. A total of ten (10) additional workshops were presented to an audience of 228 individuals. Participants included local government, code enforcement, private property owners, state agency staff, marine turtle permit holders, county employees, lighting consultants, insurance companies, and interested citizens. Funds were also used to purchase items for educational workshops, including a spectroscope, and LED flashlights that produce long wave length light.